LOS ANGELES -- A woman who owns a business that claims to be California's largest landlord of marijuana businesses sued the city of San Bernardino to overturn its pot regulation ordinance that could bar her from the industry. Stephanie Smith, the owner of a business called Bubba Likes Tortillas, said in the lawsuit filed Friday in San Bernardino County Superior Court that the city's new law could create monopolies and also prevent her from renting property to pot growers and other marijuana operations. RELATED: Plan for California pot town going up in smoke? 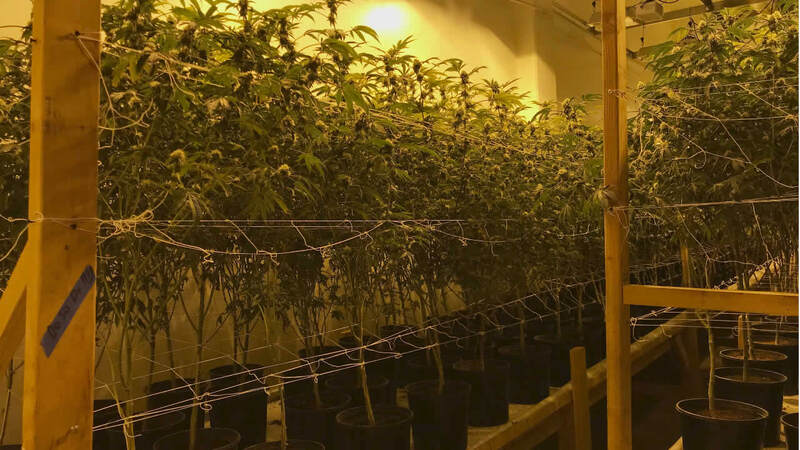 The dispute dates back to December when a fortified building Smith owns was raided, cultivation operations her clients were operating were shut down and 35,000 marijuana plants were seized. Smith was not involved with pot growing and she was not arrested or charged, her attorney Ben Eilenberg said. After the raids, a judge invalidated a voter-approved measure to regulate marijuana operations and San Bernardino City Council passed its own measure to replace it earlier this month. The new rules said anyone from a permit applicant or an employee of a cannabis business to the owner of a property could be barred from the commercial cannabis business in the city if they had violated local or state laws related to the industry or if they had failed to report income from it. Smith is concerned that could apply to tenants, or even her company, because the businesses raided in December were in the process of being licensed, Eilenberg said. They received approval letters to operate a week after they were shut down, but the law appears to make them ineligible to get licenses. "This misguided ordinance is a backdoor ban that continues the city's illogical campaign against a legal product," Smith said in a statement. "Any person who has ever had anything to do with cannabis is banned for life from entering the legal market under this ordinance. It is not what the voters want and it makes no sense." Eilenberg said it could also apply to businesses that operated in the murky days when medical marijuana was loosely regulated. Cities like Los Angeles and San Francisco have given priority to license businesses that operated under medical marijuana regulations to get into the broader retail market that opened Jan. 1. "San Bernardino is taking the opposite tack and guaranteeing that anyone in the city who operated prior to this law has to remain in the black market," Eilenberg said. The lawsuit said the ordinance would violate the constitutional right to due process by disqualifying tenants or Smith without ever granting them an administrative or criminal hearing. The lawsuit also claimed the city law could create monopolies of certain types of marijuana operating licenses. The ordinance would allow 17 commercial marijuana businesses in the city, but there are 19 different types of licenses that could be issued, everything from growing pot, to transporting it, testing it and selling it. A city spokeswoman did not immediately comment on the case. Click here for more stories, photos, and video on cannabis.